which, in the terminology of musical form, might be described as an �example of the binary form in miniature. Although we may know absolutely nothing about the materials and details of the piece briefly described above, yet a clear perception of its general outline, which is obtained from a knowledge of the order of the appearances of the themes and the sequence of the keys, is a help both to its intelligent study and memorization. Some may argue that the large majority of pieces proceed in such a manner as to prevent the possibility of �confusion between appearances of the same passage in different keys. This is undoubtedly true, but it is also true that no small number of pieces exist, in which, if we have not a clear idea of the sequence of the keys definitely fixed in our mind, in playing from memory, a moment's inattention will make a serious error possible. 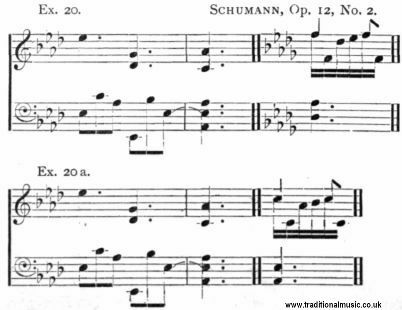 Thus, what may be called the second subject of the "Aufschwung," from Schumann's " Phantasiestiicke," appears first in D flat, and then in the recapitulation in A flat, although the passage and cadence which precedes it is identical on both occasions.